The spring semester rushes by in a torrent, a blur of lesson plans and grading, family and board games—and, always, writing. My favorite moment of each school year is also my most busy: publishing my school’s literary magazine. My ragtag group of writers, artists, and unsung heroes never fails to amaze me. Their passion and talent spill across the pages as they design and create content for the yearly publication. The magazine is the culminating event of months of reviewing pieces, submitted from students throughout the school, and countless hours of effort. I love to watch as my students’ vision unfolds and everything—typically at the last moment—comes together. I created this literary magazine class because I wanted a space that celebrated the creative arts. But more than that, I wanted students to embrace their identity as creators at an earlier age. And each year, I have the privilege of witnessing that happen. These teens write as writers; they paint and photograph and sculpt as artists. And yearly our school community is blessed with their works of beauty. There is so much in the world today that doesn’t encourage hope. From the humanitarian crises to the political landscape, the future often appears heart-rending and dark, fit more for a novel I’d write or read than what I hope for my son as he grows older. But these teens exude such wonder and curiosity and life. They organize protests and play impromptu D&D; they juggle afterschool jobs and forensics tournaments; they listen and ponder, laugh and cry; they fumble and stumble through all of life, mountains of stress and expectation weighing on them in ways I cannot imagine, and through it all they inspire such hope. I’m thankful for the privilege of this time they pass through my classroom. I’m grateful for who they are, and the measure of stardust they leave in their wake. The Day My Students Wondered: "Who Might Affix My Head to a Spike?" Recently, my students finished reading Lord of the Flies, and I had them perform this thought experiment: What would happen in an all-female retelling of the novel? My students hadn’t heard of the proposed movie remake, so thankfully their thoughts were all their own. It’s strangely interesting to watch students stare at their peers and wonder, “Who would cut and tear my flesh, affix my head to a spike?” Their responses ranged from the silly to the macabre, the sexist to the mundane. Some argued that the girls would have lacked the survival skills necessary to survive, while others contended that the girls would have collaborated with ease, finding a more truly democratic means of maintaining order. Some painted a picture of kumbaya-singing solidarity—a complete reversal of what transpired with the boys. A few conceded that the girls would have splintered into factions and suffered from bitter infighting like the boys, but most maintained that the girls wouldn’t ultimately stray into violence. In the words of one, the “white savagery” that steered the brutal path of western history was only the curse brought by men. We all laughed at the shared responses, the thought experiment easy to brush off. In the end, my students did not, as Capote put it, regard each other strangely, and as strangers. As we read this novel, we grappled with the essential question of who we are. We read of Jack leading his tribe in the brutal pageantry of violence, sharpening their sticks into spears as they chant, “Kill the pig! Split its throat! Spill its blood!” We discussed the horror of when this “demented but partly secure society” finds a safety valve for its fear in a communal act of violence. But this violence felt remotely distant from our white-tiled classroom in cozy Northwest Arkansas. After all, the novel is itself a mere thought experiment, based on data from a world war far removed from our own time. At least, we hope it’s distant. Still, in many responses students hinted at real twinges of pain suffered in these early years of their life, mostly from the young women. In their descriptions of the splintered factions and betrayals, I saw the broken friendships of their junior high days. In their descriptions of violence, I saw the imprint of a cruel and often violent world on their impressions of human nature. These responses reminded me of all the pressures these students have to bear, unspoken and often unnoticed. That in their eyes life can feel as savage as life on Golding’s island. So many of us, so much of the time, operate with such a degree of certainty that we feel emboldened to speak our minds with impunity—whatever the damage. When a woman speaks of how sexism has affected her life, so many (men) will shout into the wind all the ways she is wrong. When a black man speaks of his experiences of systemic and personal injustice, so many (white) people will drown out his voice with a cacophony of their own. How powerful it is to listen, to truly hear, and to reorient ourselves to view a situation from another’s vantage point. How powerful is empathy. And in the wake of it, how much more powerful are our actions. Now, in the messy aftermath of the DACA ruling, this same ugly pattern reasserts itself. I pray that this time we could listen, and then, in turn, stand for grace and justice. A student who graduated from the high school I teach at (before I started working here) was recently featured on our local NPR station, highlighting her plight as a DACA recipient now that the DACA is being abolished. Her story is sadly a common one—yet heart rending and powerful. Like many Dreamers, she arrived here when she was only a toddler, excelled in school, and then faced the uncertain fate of life as an undocumented. She wanted to further her education, but she couldn’t secure federal loans, or even qualify for in-state tuition, so her undergraduate career stretched out over eight years, taking what classes her family could afford while working odd jobs in construction, house cleaning, childcare, etc. In her own words, before DACA she “had little hope for the future,” but then when she was approved for her DACA work permit her “life changed completely.” She secured a great internship and began to live without the pall of an uncertain fate casting its long shadow over her life. Her testimony is a powerful one. And yet, in the comments on her Facebook post, the same tired dialogue gets played out again and again. Worse are the comments played out on our national stage. Demands that DACA recipients pay back the tax dollars they’ve stolen through Medicaid and food stamps. Fear mongering about the crime rates of these pernicious foreigners. Never mind the fact that Dreamers have no route to citizenship. Never mind the fact that they pay income taxes but cannot even be eligible for social programs like welfare. Never mind that they cannot have a criminal record to even be eligible for their work permit. They came when they were children. Regardless of which side of the political aisle you lean toward, listen to their stories. Learn, feel before you speak. By way of parting, I’ll leave you with this young woman’s concluding thoughts themselves, as it’s fitting to let her have the final word. At the close of each school year, I am always drawn to reflect on my successes and failures, tallying plenty of both. This year was no exception—though one success stood out to me. About halfway through the year, I decided to try out something different with my students—an Ask a Grownup life advice question and answer series. My inspiration came from an episode of This American Life I happened to have listened to that described a project by an online teen-girl-targeted magazine called “Ask a Grown Man” (readers would write in for life advice, and then celebrities such as Stephen Colbert or Seth Rogan would respond in a video). So, I assigned my students to do the same, to submit anonymous questions that I would answer as best as I could. On a more serious note, I told them that life was messy and plagued with uncertainties, but that I would share honestly about my own successes and failures and offer what wisdom I had gleaned in my thirty-four years. I had no idea how it would go. It was weird. It was awesome. The questions ranged from poignant to silly. My first question was a tough one: “Why aren’t eyebrows considered facial hair?” But the ones that followed showed the broad array of pressures my students experience. I answered queries about how to manage finances, what to consider when choosing a college major, how to navigate political or religious differences with parents. I addressed bullying, mental health, life’s elusive purpose. Sometimes we neared tears. Other times our sides split with laughter. I loved a lot of aspects of this school year, but these moments we carved out of our class time to wrestle with the insecurities and dilemmas intrinsic to students’ lives were among my favorites. I believe strongly in educating the whole person—equipping students with not just my discipline’s essential skills but also with those skills essential to living a full and worthy life. After my class, I hope my students find themselves leaning into their better selves more—practicing more grace and forgiveness, agitating more for justice, inclining their hearts more toward love. And year after year, I find my students inspire me to do the same. While I’ve loved reading my whole life, I did not enjoy my English classes much of the time. I resented having to waste my time, as I thought of it then, reading those dreary books assigned to me. I longed for tales of adventure and conquest, and I couldn’t have cared less about the mundane inner struggles of boarding school boys or whatever it was that was thrust upon me at the time. Maybe if Steinbeck had complicated the plight of migrant workers by adding a dragon invasion to the equation, or if Shakespeare had explored the twisted ambition of the King of Gondor, I could have found myself more in these stories. I knew what I liked and already read voraciously; what more could English classes have to offer? This bias against literary fiction began to unravel starting my tenth grade year and continued to erode my junior year. But it wasn’t until my senior year in AP Literature that it was finally dislodged completely. The book that proved its undoing was Slaughterhouse Five by Kurt Vonnegut. A blend of sci-fi and realistic fiction, the novel depicts the haphazard journey of Billy Pilgrim, who flits in an out of time as he struggles through one trauma and then another. He is unstuck in time, as the first line of his story tells us, and so he cannot control his time travel, forcing us to jump with him. And so we jump through his tragedies: his capture by Germans during WWII, the firebombing of Dresden, his depressed middle-aged years as an optometrist, and, of course, his abduction by aliens. For Billy is taken to the planet Tralfamadore to live in a zoo there, and eventually is taught to view time as an expanse without end—an expanse in which each moment is always happening. I love this novel for its dark humor; for Vonnegut’s delightful curmudgeon of an alter ego, Kilgore Trout (whose novel summaries are hysterical); for the absurd sadness of Billy Pilgrim, a listless plaything of enormous forces. But most of all I love the novel for how richly it rewards close reading. At first, I accepted his tales of aliens and time travel, but by the end I realized that these fantasies were merely the concoction of his PTSD-affected mind. Unable to cope with his trauma, he creates a new philosophy of time, one that allows him to accept tragedies such as the war because everyone who died is still alive in another moment, and always will be. I hadn’t had to delve that deeply into a text before, but in doing so I felt the forceful call of literature on my life. Slaughterhouse Five changed my life. As a result of this experience and the ones that followed, I majored in English in college. I then went on to get a master’s, and now I teach high school English, getting to share with a new generation of readers the joys of this very novel. And while I don’t write literary fiction, this novel unlocked for me a fuller appreciation for what stories can be—an appreciation that still informs my writing. So many books have left their inky traces on who I am, yet the next book I want to highlight stands out as a seminal turning point in my reading life. In Middle School I began to dabble in those longer fantasy tomes housed in the other side of the bookstore. I began with works like Terry Brooks’s Shannara series and the Dragonlance trilogy. But the book that hooked me into the fantasy universe for good was Terry Goodkind’s Wizard’s First Rule, the first in the Sword of Truth series. Its protagonist, Richard Cypher, was a typical but compelling unlikely hero, a woodsman more at home around a camp fire than striding into battle. He was aided by Gandalf, cough, I mean Zedd, a powerful wizard who took on the older mentor role with gusto. They explored a universe that was enchanting and expansive, populated by magical beasts, individuated kingdoms with vying political aims, and myriad dangers that lurked in every thicket or seemingly empty sky. The book propelled me into the action and immersed me into its world from the first page. And I’m still living, breathing that same world. The names have changed over the years, from the D’Hara to Middle Earth to Two Rivers, and more recently to the Kerch haven of Ketterdam and the Blackcliff Academy at the heart of the Martials Empire, but the song I hear when I turn these pages is an echo of the one I first heard years before. It was here that I fell in love with world building, in this ground that the seeds were planted for me to write fantasy works of my own. I only hope that someday my own worlds will spawn the worlds of others. What books caused you to stray into different worlds? I’m in the midst of my poetry unit with my AP Literature students, and right now we’re examining the form of poetry. Last class, we analyzed the traditional structure of a Shakespearean sonnet, and tomorrow my lesson plans included, coincidentally, one of my favorite Petrarchan sonnets so that students could contrast the two forms. The poem in question is “The New Colossus,” Emma Lazarus’s famous sonnet that adorns the Statue of Liberty. This poem is a beautiful expression of one of our core American values—that we would strive to be a beacon of hope in this world, welcoming those fleeing oppression in search of our elusive yet captivating American Dream. It’s an ideal written into the fabric of our national ethos, stamped in bronze on a symbol of who we strive to be. And yet. It is now national policy to ban admittance to immigrants from seven countries, regardless of the vetting these people might have undergone. Green card holders—legal residents—will be turned away. Thousands of refugees who have been seeking asylum within our borders for years must now turn elsewhere, seized at airports like criminals. So, tomorrow I will begin my lesson on the Petrarchan form, but as is so often with literature the intersection between art and life is too near to the surface to ignore. I hope as my students’ engage with this century-old promise they embrace its values. I hope that messages of hope and empathy can still resonate in today’s rhetoric of fear. In parting, I’ll leave a political cartoon from a distant, and I still hope different, time. Let us learn from our past without repeating it. Over the holidays I was inspired by my mother to reflect upon the books that have shaped my life. I’ve been a reader since birth, so it’s hard for me to select only a few, but since that conversation a few have risen again and again in my thoughts. The next few blog posts will be dedicated to these formative books and the way their stories changed my life. The first of these books was not difficult for me to choose. Bruce Coville’s sci-fi and fantasy books aimed at adolescents swept me away as a child. I devoured his books whole and demanded more. I completely lost myself in his pages, an experience so entrancing that it ensured I’d be a reader for life. And among all of his books (his bibliography tops 100 books, and I’ve read dozens and dozens of them), the first one that captivated me, the first series I ever felt the pangs of waiting for a release date, was one of his very first: My Teacher Is an Alien. The book follows three kids in an elementary school, a popular girl, a bully, and a nerdy guy, who discover together that the old cliché is true—their teacher really does harken from a distant world. However, [SPOILER ALERT] it ends with a twist. Rather than the alien seeking to invade or destroy Earth, he came to learn, and when the alien’s identity is outed, Peter, the nerdy kid, feels compelled to leave with him. Even two decades later, I can remember my excitement each time I returned to that book. My mother was already heavily involved in the American Library Association at the time, and one day she surprised me with an autographed copy of this book. 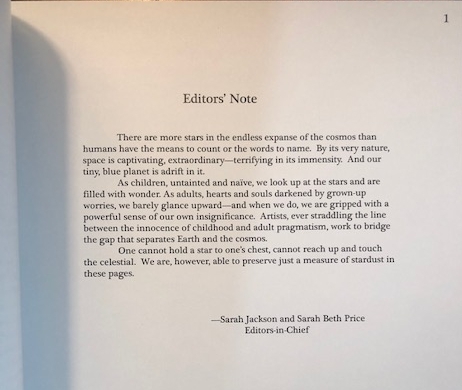 I opened to the cover page, and there I saw in slanted script my favorite author’s name, along with a dedication: Keep looking to the stars! Thanks to this book, and to others like it, I’ve never stopped. I still have all of my books from childhood. Someday soon, I’ll pull them all down from the attic and hand them over to my son, starting with this book. We’ll read the dedication, and I’ll tell him of how much this story resonated with me when I was his age, and how it still does. And then we’ll read the story together, excitedly turning the pages, and hopefully he’ll fall under the same spell that has held me in its sway all these years. I wonder, what books shaped your lives? Perhaps it’s time to return to the books wherein you first beheld the magic of immersing yourself in other lives, other worlds. The gray clouds of December threaten overhead, my students have begun to beg and plead for late-grades and leniency, and teachers wander the halls, bleary eyed in a haze of grading—all of which mean that the frenzied holidays are soon upon us. For many this is a time of dread. Family can be a source of anxiety, an unwelcome trigger to revisit unresolved pain. For others it is a time of mourning, their homes empty of the ringing laughter or calming presence of their lost loved ones. For almost all of us, it is a time of stress—a blur of tasks and unexpected expenses. This is why I love the season of Advent. It reminds us that life is often full of the pangs of waiting. Each week in preparation for the coming of Christmas, we light a candle: the first week for hope, the second for peace, the third for joy, and the fourth for love. We light these candles not in a blind Kumbaya to insulate us against the harsh realities so evident in 2016, but precisely because of them. The world needs a stronger hope; it clamors for peace; it longs for greater joy; it is desperate for love. So we strive cultivate these characteristics in ourselves and in our community, even as the Earth keeps on madly spinning. Recently, my church found out about a family of five who is relocating here in a few weeks, just days before Christmas. They’ll come empty handed, displaced from their house and the urban Baltimore neighborhood they’ve called home for their whole lives, fleeing loss and pain. Hours away from all they’ve known, they’ll probably feel like aliens in an alien land. They are a flesh-and-blood reminder of the need for greater love in the world. So we do our part, however slight it might seem. We plan to pack out their apartment, so that they will arrive to closets already lined with clothes and pantries already full of food. We will welcome them, assist with their basic needs as they regain their footing, and hope our loving community can meet some of their less tangible needs as well. This is what Advent is about: active waiting—believing that the moral arc of the universe may not be as long as it seems, and helping it to bend toward justice with whatever small acts we able to offer. Go in peace, my friends! Thank God this election cycle is coming to an end. It has been so tortuous, a plot too unbelievable to be penned across pages (Seriously? Anthony Weiner again?!?). We’re all glad to be rid of it, though its bitter taste will last for months, years perhaps. I hope that we can move beyond a post-facts politics driven by fear, reassert a posture of optimism and, dare I say, mutual respect. Time will tell. But what interests me on the eve of this election is how the same result—the election of either Hillary or Trump—will be heralded as either apocalyptic or a saving grace for our country, with few people’s reactions falling in between. So many of us—myself, at times, included—regard our own views with such certitude. We know that our view is the correct view. We light the beacon of truth or civilization or whathaveyou. Those others are part of the dark tide threatening to drown us all. Granted, if ever there were an election to be certain about, this would be it. But I see this certitude in issues beyond the presidential candidates. So many of us seem to have the answers so much of the time, about a whole host of issues. My friend the peacenik knows what has led to the cycle of violence in the Middle East, sees a simple path forward to a peaceful resolution. My friend bernin’ for Bernie sees the corruption of money in politics and knows how easy the revolution would be if only Washington would allow it. My friend the conservative holds forth on how laissez-faire economics is the only morally just, God-ordained system. And my libertarian friend proclaims the gospel truth of… whatever it is that libertarians believe. And I find within myself a different set of rigid certitudes, ones that set my teeth to gnashing whenever someone spouts off anything that deviates from my doctrine. Yet at the same time I don’t view the world in bichromatic black and white, so why do I react this way? I should hold my opinions with a greater sense of humility. If I recognize that the issues of the world are more complex than I, from my static position of race, socio-economic status, age, and background, could ever understand completely, I should stop every once in a while to see if I could maybe learn from those across the aisle. So that’s my hope for us moving forward. That we would entertain doubts, proclaim less, and listen more. That we would offer our pronouncements about the world more gently, hold our opinions less as etched tablets from Mount Sinai and more as drawings in the sand. Grace and peace to you all, my friends. "Man the sum of his climactic experiences Father said. Man the sum of what have you. A problem in impure properties carried tediously to an unvarying nil: stalemate of dust and desire." "Father said that man is the sum of his misfortunes. One day you'd think misfortune would get tired, but then time is your misfortune Father said. A gull on an invisible wire attached through space dragged. You carry the symbol of your frustration into eternity." "Father was teaching us that all men are just accumulations dolls stuffed with sawdust swept from the trash heaps where all previous dolls had been thrown away the sawdust flowing from what wound in what side that not for me died not." "But you said we had a situation." "I didn't say it. The computer did. The whole system says it. It's what we call a massive data-base tally. Gladney, J. A. K. I punch in the name, the substance, the exposure time and then I tap into your computer history. Your genetics, your personals, your medicals, your psychologicals, your police-and-hospitals. It comes back pulsing stars. This doesn't mean anything is going to happen to you as such, at least not today or tomorrow. It just means that you are the sum total of your data. No man escapes that." "Everything that goes on in your whole life is a result of molecules rushing around somewhere in your brain." "Heinrich's brain theories. They're all true. We're the sum of our chemical impulses." Interesting the difference 57 years make. I wonder what answers the next decades will bring. If the intervening weeks between my last post and this one weren’t a clear enough indication, the school year has started. And the deluge has begun. Lesson planning, grading, lesson planning, grading, winging it, and more grading—such are the rhythms of a teacher’s life. Yet—what a life it is! Each year I am struck more and more by how confounding the profession of teaching is. It is dynamic and at times grueling, a job that always comes home with you, but beyond the frenzied madness of it all I find it deeply rewarding. I spend my days investing in the lives of teens, prodding their minds and urging them onward toward depth and nuance. And along the way I get to delve into my favorite works of literature and unveil them before my students’ untrained eyes, watching as they experience so many firsts with the written word. Every week I utter the phrase, “I love this job.” Some weeks, it’s every day. These first few weeks I have been edging slowly into literary analysis with my students, examining a single aspect of a short story at a time. At each turn, students are discovering that there is so much more “texture”—to borrow a term from Bradbury—to literature than they initially expected. We’ve explored the works of such luminaries as Tobias Wolff, Raymond Carver, Flannery O’Conner, Hemingway, Donald Barthelme, Aimee Bender, and Tim O’Brien, and at each new story students confess that they’ve never read anything like that before. After years of lying dormant, their sense of wonder regarding literature is beginning to awaken. Being at the helm of their experience is exhilarating. Granted, I should state that, due to whatever cosmic fate, I have landed in one of the best school districts in my state, teaching AP-level classes in a community where striving for excellence is a part of the culture. I recognize this is not the norm. I have teacher friends who labor in vineyards so foreign from mine that their experiences have almost no overlap with my own. But for all of us who feel called into this profession, it is the light in our students’ eyes when at last the cogs whir to life in a new and surprising way that draws us again and again to the classroom. When the stacks of grading grow too high, when the administration outlines yet another superfluous or ill-concocted policy, when the teenagers who fill our classrooms exasperate us for behaving exactly how teenagers are wired to behave—it is good to remember why we entered the classroom in the first place. In that way, my students teach me again and again to never lose my own sense of wonder.